I love this easy Halloween craft! It is a bouncing spider that takes 15 minutes to pull together. Easy, cute and Halloween fun for kids! 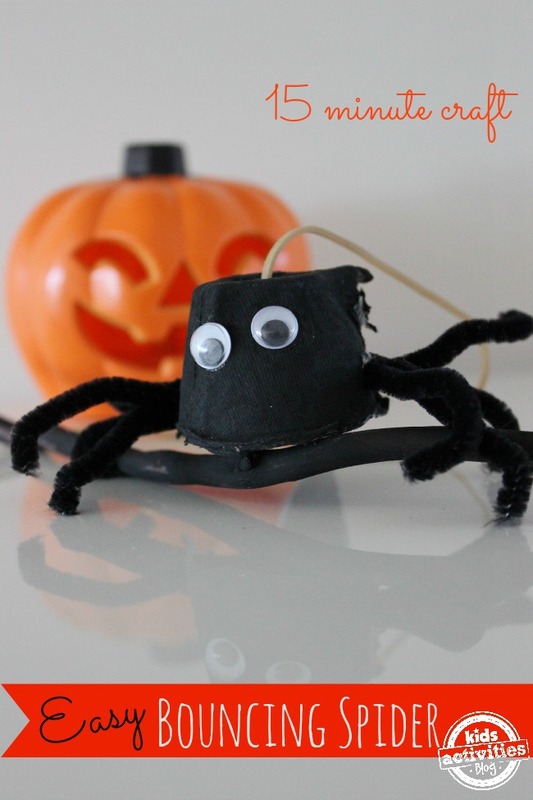 This cute little spider is sure to bring on the giggles for little ones as they watch him bounce around. 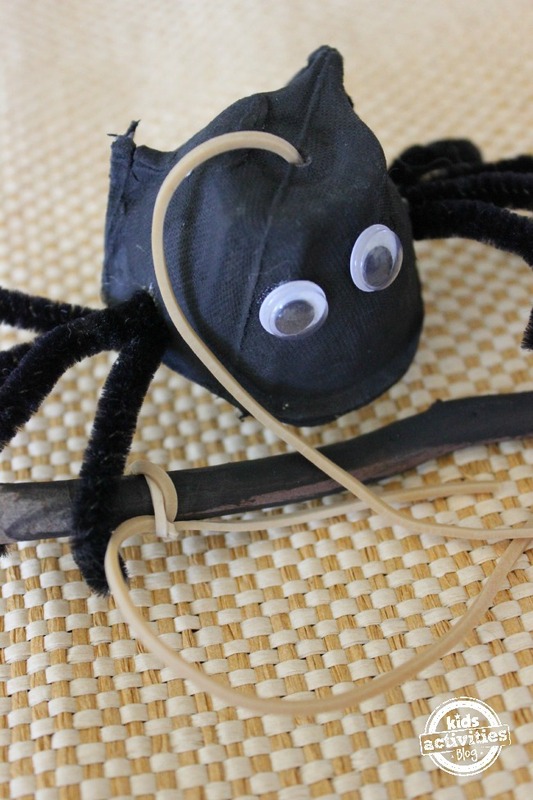 Making the spider is very simple and it is a quick fifteen minute project that will lead to lots of fun and play. 1. Cut a section from the egg carton and paint it black. This will be the spider’s body. 2. Cut each of the black chenille sticks in half, so you now have four lengths. 3. Pierce a hole in each side of the spider’s body. Now push all four lengths of chenille stick through the hole on one side of the spider and out again through the other hole. You now have eight spider legs. If you like, you can bend the ends to form feet. 4. Glue the two googley eyes on to the spider’s face. 5. Pierce a hole on the top of the spider. Take your elastic band and cut it so that it is no longer a circle, but one long length of elastic. Tie a knot at one end and then thread the elastic through the hole on the top of the spider so that the knot is on the inside. Tie the other end of the elastic to your stick or dowel. You’re done! It’s time to start playing! There’s sure to be lots of giggles as you watch your spider bouncing around all over the place. Why not make some other fun Halloween characters to join your spider? A bouncy green frog could be made in the same way as the spider, or you could make a ghost by gluing a tissue or some white fabric over the the egg carton. What other characters would you like to make? These are super cute! My boys will love this. Adorable! Thanks for sharing at After School. I love all of your fun and easy Halloween crafts for kids. Your bouncy spider is today’s Dare to Share Feature of the Day! 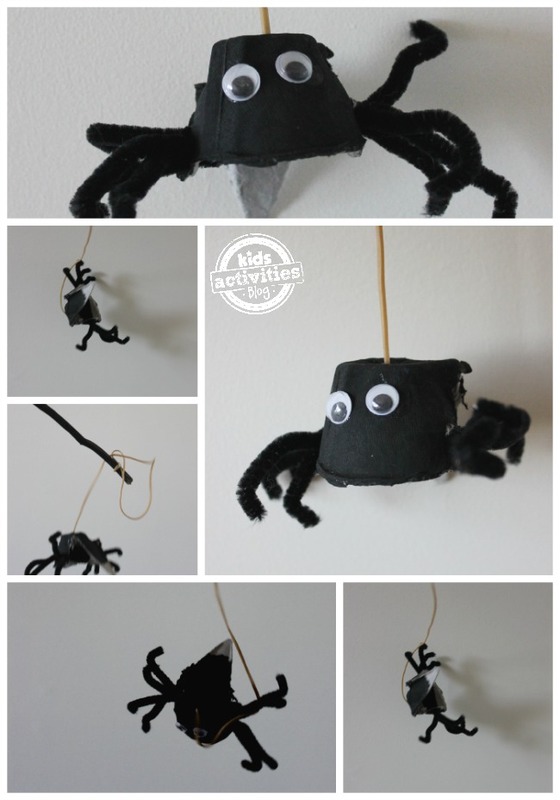 http://www.pamspartyandpracticaltips.com/2013/10/bouncing-spider-halloween-craft-feature.html Thank you so much for linking up each week. Can’t wait to see what else you have to share.